Instant Pot White Rice is an easy recipe to master and one you’ll use again and again. This is a great, simple recipe and in today’s post I’m going to teach you how to make it and also give you tips on how to properly store it so you can cook it in bulk. 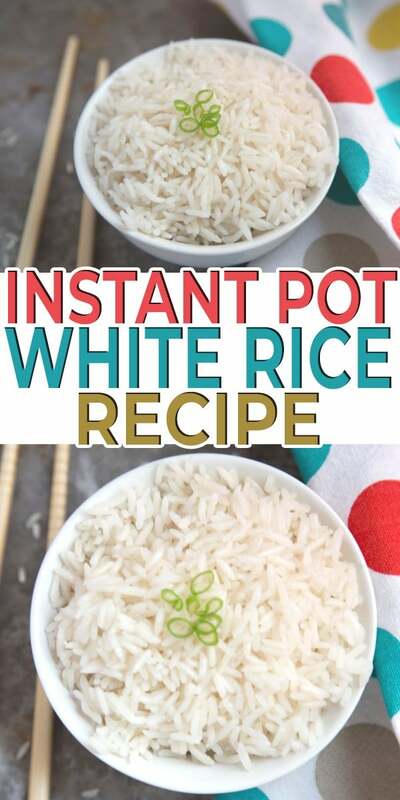 When it comes to Instant Pot recipes, making white rice is a great one for beginners and a staple for every Instant Pot owner. Serve it plain with your favorite Asian recipes or add some vegetables for color and nutrients. For this recipe, we used Great Value Long Grain Enriched Rice. It’s super affordable and foolproof when it comes to making rice using a pressure cooker. Should you wash your rice before cooking your Instant Pot Rice? The answer is “it depends.” In most cases it’s not necessary to wash your rice before you cook it. When you rinse your rice, you are rinsing starch out, and this controls how sticky the rice will be. If you want nice, fluffy rice that doesn’t clump together, rinse it first. First, spray the inner liner with cooking spray. This will help prevent your rice from sticking to the pot. Next, add the rice, water and salt to your Instant Pot and secure the lid. For the rice and water, use a 1:1 ratio. For every cup of rice, add one cup of water. Add 1/4 teaspoon of salt per cup of rice as well. Turn the valve to “sealing” then press the Manual or Pressure Cook button. Set the time for 4 minutes. When the pressure has fully released, your Instant Pot White Rice is ready to serve! 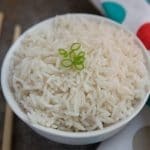 Can I add flavor to Instant Pot White Rice? Absolutely! To add flavor to your rice, simply substitute your favorite broth for the water. In addition to, or in place of, the salt, add your favorite herbs and spices. I like garlic powder and oregano. But you can also try lemon pepper, dill, or seasoned salt. My kids often add sauce to their rice. A little splash of soy sauce or teriyaki sauce after the rice is cooked can make a big difference in the flavor. Can I freeze and reheat cooked rice? 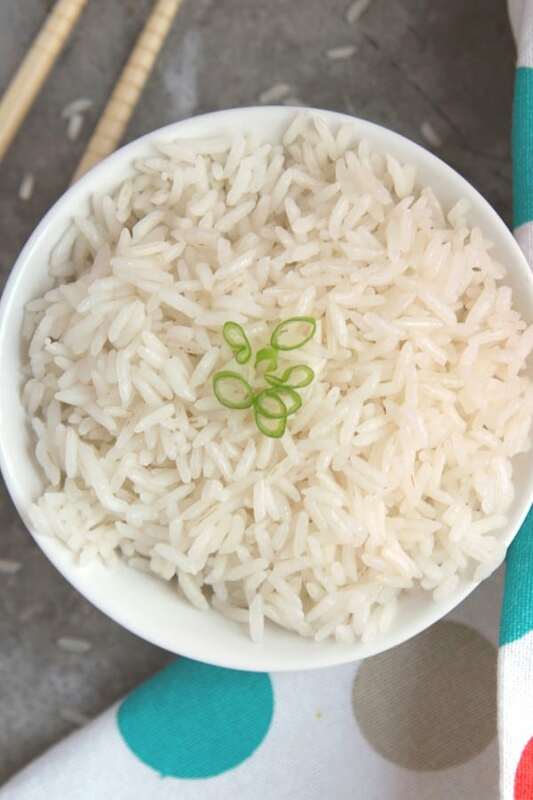 One great tip to help you save time in the kitchen is to freeze your cooked white rice to use for later. To freeze your Instant Pot rice, just measure your desired portion sizes into freezer-safe plastic bags or containers and seal tightly. You can make a big batch of rice and store in one cup portions to add to your recipes later in the week. Add some leftover chicken and frozen vegetables for a quick and easy meal. Properly stored rice can be kept in the freezer for up to 6 months. To reheat frozen rice, simply place in a microwave-safe bowl, add 2 tablespoons of water or broth, and warm in the microwave. Prefer to print out the recipe? Here’s the recipe card with exact measurements and step-by-step instructions. Spray inner liner of Instant Pot with cooking spray. Add rice, water, and salt into the Instant Pot. Press Manual or Pressure Cook and set time to 4 minutes. Natural release for 10 minutes, then do a “quick release” to let the remaining pressure out. Your rice is ready to serve. Hi Barb! Thanks for asking. I’ll add that to the recipe card.